A dedicated server offers best in class security and performance, as the resources are not shared among other users. If you are looking to setup an e-commerce website, you should definitely opt for the best dedicated hosting. 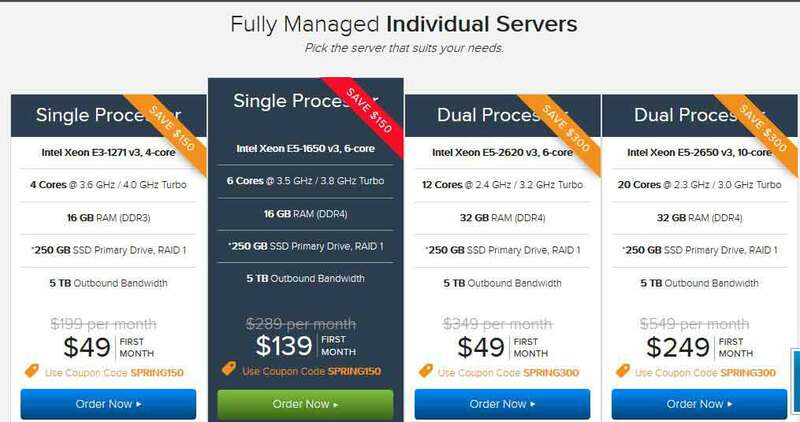 Which is the Best Dedicated Server Hosting in the World? There is a lot of competition in the market and it is difficult to choose the best among many. For your convenience, we have searched and prepared a list of 10 best dedicated server hosting providers that extend impressive features at an affordable cost. The best thing about iPage is t their ‘fully-managed’ servers. You won’t face issues such as site loading, network problem, hardware failures etc. The host offers both Linux and Windows based servers with 24/7 customer support, up to 16 GB Ram, 1 TB storage and free domain registration. Pingdom.com shows an average of 99.98% uptime for iPage in the last 30 days. iPage has a very responsive customer support ready to assist you 24/7. Both online chat and telephone support are accessible. You won’t have to pay extra for iPage backup solution; that is included in the plans. The storage capacity is the same as the hard disk capacity. iPage offers SSL certificates at $31.99/year. In addition, you get anti-malware software for email protection. 1and1 web hosting is popular for its flexibility. 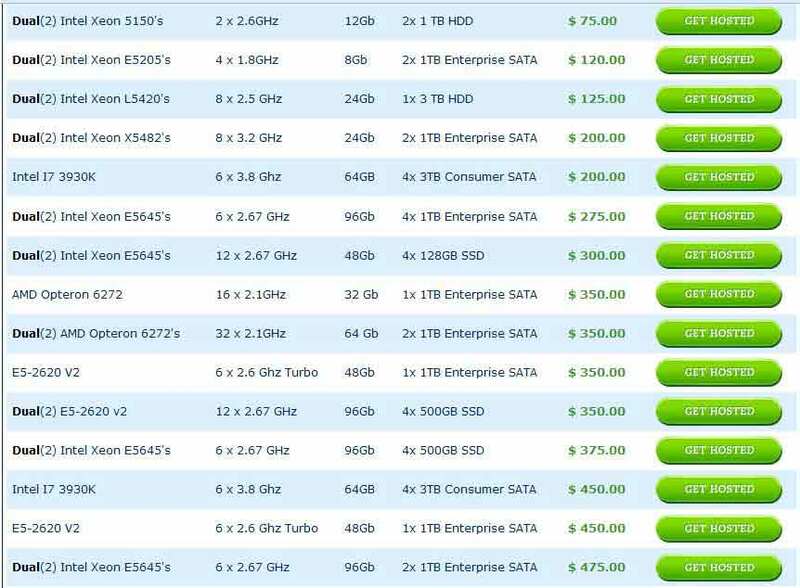 The host offers 12 different plans starting at $34.99/month ($69.99/month after first month) and each plan extends varying amount of CPU speed, Ram and hard disk space. The ‘L4’ is the basic plan boasting AMD Quad Core processor, 4 Cores x 2.1 GHz speed, 4GB ram and 750 GB hard disk space. 1and1 hosting allows unlimited traffic and discourages bandwidth throttling, which makes it one of the best dedicated server hosting. Uptime report shows 1and1.com has 99.921% uptime. 1and1 Web hosting does not offer chat support to non registered users – a big drawback. However, you can call on their toll free number for any inquiry. You can either buy the Professional backup solution or FTP Storage. The Professional backup solution starts at $9.99/month with 10 GB limit, while the FTP storage starts at $19.99/month and offers 250 GB storage limit. 1and1 dedicated servers are SSL certified for maximum security. You can also buy additional security features such as 1and1 Antivirus and the Firewall, which is free on 1&1 Server packages. LiquidWeb offers a range of affordable packages with single processor, dual processor, and quad processor dedicated servers. Moreover, you can choose between self-managed, core managed, and fully managed plans. The key features include up to 64 GB Ram, 1.5 TB storage capacity and 20 x 2.3 GHz / 3.0 GHz Turbo CPU speed. According to Sitegeek, LiquidWeb has 80% positive user reviews, while the uptime.besthostrating.com reports 99.961 % uptime. A good customer support is essential to become the best dedicated server hosting company and LiquidWeb prides itself on the amazing 24/7 support, known as ‘Heroic Support’. Liquid Web has a special ‘Guardian Backup’ service, which starts at $25/month featuring 100 GB storage. For maximum protection of your dedicated server, LiquidWeb offers Server Secure Plus that includes a free SSL certificate, firewall protection, Anti-spam and Anti-virus protection, daily security audits and more, starting at $50/month. Coupon code: Use coupon code SPRING150 to save $150 on first month and SPRING300 to save $300 on first month. JustHost is the best dedicated server when it comes to instant set up. The company uses modern Intel Xeon processors, provides complete root access and advanced cloud technology for quick upgrades and enhancements. All plans offer Raid 1 protection, so you won’t have to worry about losing your data. It achieved 99.9% uptime in the previous week, and has 71.43% positive user reviews according to Sitegeek. JustHost has a 24/7 customer support and I checked the live chat personally by asking the representative difference between VPS and Dedicated hosting and he was quick in guiding. You can also contact them via phone to get quick information. JustHost offers free daily, weekly and monthly backup solution, and the storage capacity is according to the plan you choose. To keep your server clean from Malware, enable the ClamAV service in WHM. It does not require extra cash. The Comodo private SSL certificate can be bought for $6.67/month. Launched in 1996 Bluehost is one of the oldest and among the most preferred hosts in the market. The customers were facing CPU throttling issue recently, but as per information disclosed by webhostingsecretrevealed it has been fixed now. The ‘Standard plan’ now gives you an increased 2.5 GHz CPU speed and 1TB Storage with 4 GB Ram. 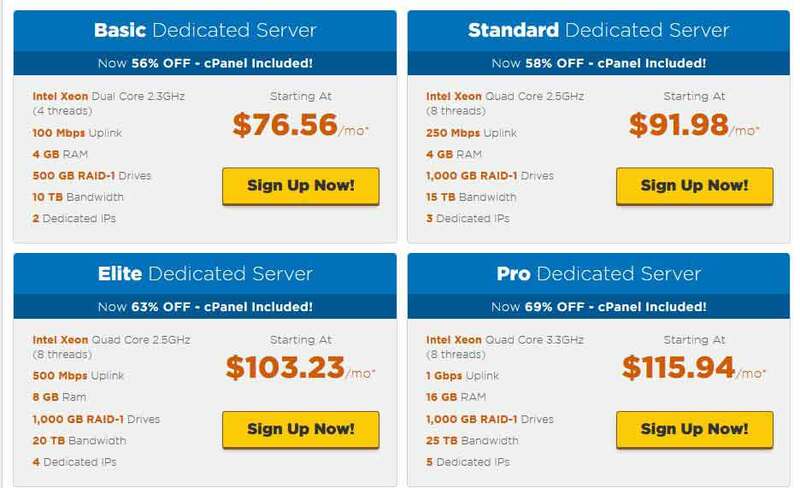 It is among one of the best dedicated hosting companies, according to bigcheapchosting.com. The key features include up to 16 GB Ram, 1 TB storage space and 3.3 GHz CPU speed. According to hostbenchmarker.com, Bluehost had an average uptime of 99.92%, but it has been dropped below 85%. BlueHost offers an amazing 24/7 customer support with representatives quickly available to answer your queries. In addition, the phone support is ready for quick answering. 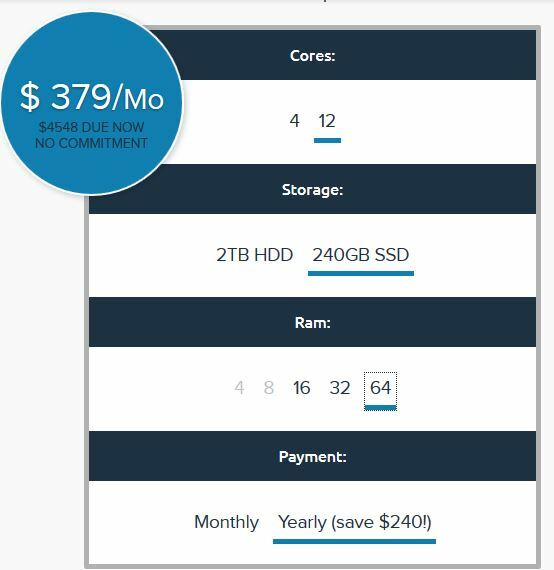 You can setup your own backup schedule through BlueHost Site Backup Pro, which starts at $35.88/year with 1 TB storage capacity. The host has achieved an average of 99.94% uptime, but has also gone below 95% for a few days. For basic issues such as network failure, hardware failure or set up complication, GoDaddy provides free 24/7 customer support. 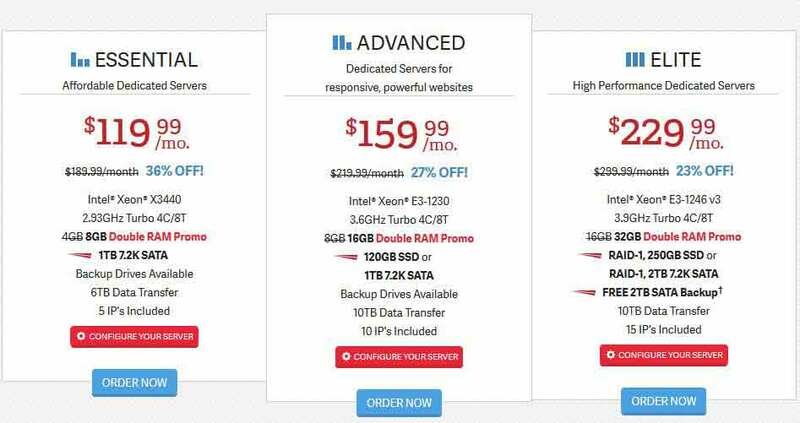 For expert help regarding MySQL Databases, installing 3rd party software and backup process etc., you will have to pay $49.99 for 30 minutes of assistance. 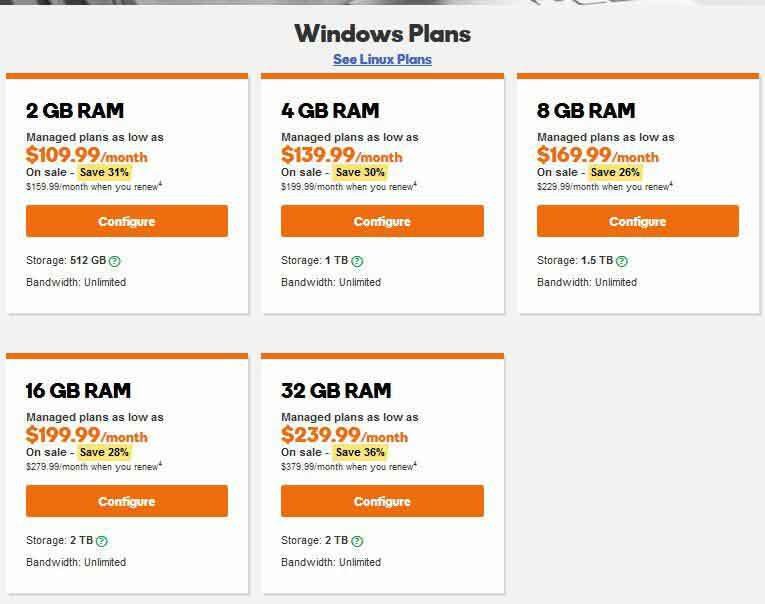 Godaddy charges extra for backup solutions. There are two backup options; FTP backup solution and Managed backup solution. The FTP backup solution starts at $4.99/month with 20 GB storage, while Managed backup solution starts at $29.99/month. To secure your server, firewall is necessary, but GoDaddy does not provide any by default. You have to buy the Cisco ASA 5505 Firewall for $ 34.99/month. 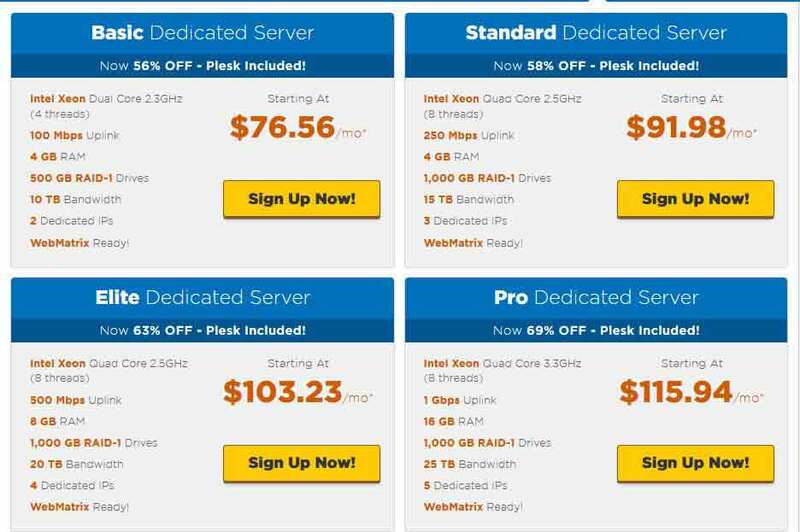 HostWinds dedicated server plans start as low as $100, and the best part is that you can customize them according to your preference. For example, the basic plan with 8GB ram and 4 x 3.9 GHz Turbo processor can be optimized to 16 GB ram and a higher speed. For e-commerce purposes, HostWinds provides the Magneto e-commerce app, which is very hand when you have to create an online store. The host also renders both Windows and Linux based servers. HostWinds guarantees a 99.9% uptime. Though we couldn’t find the uptime report on any monitoring tool, but PcMag review suggests that they tested a website hosted on HostWinds for a period of 30 days and it didn’t go down even once. HostWinds presents a prompt and impressive 24/7 customer support. The representatives are always available easily and you won’t have to wait long to have your queries heard. If the call charges are expensive in your country, give them your number and they will ring you. Backup solutions on dedicated server plans are not free of charge. 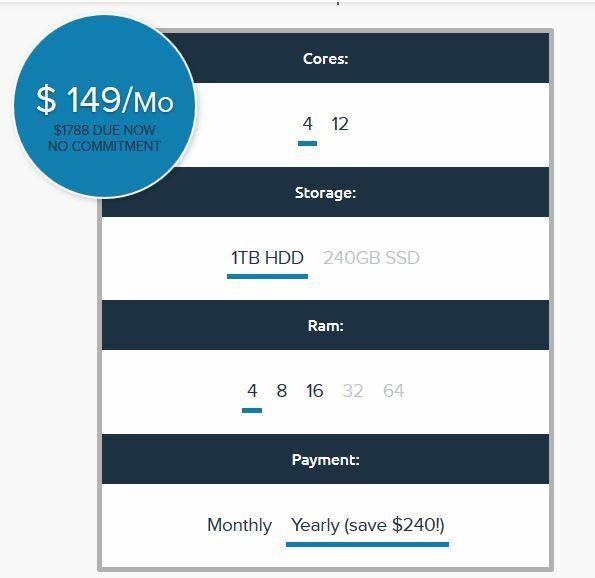 However, you can purchase the R1Soft Backup Solution for $35/month with the storage capacity same as the plan you choose. HostWinds SSL certificate can be bought for $75 one-time payment and the DDOS protection costs $25 monthly. Additionally, you can purchase the Advanced Server Monitoring service for $5/month which allows the HostWinds experts to monitor your server and fix the problems automatically. 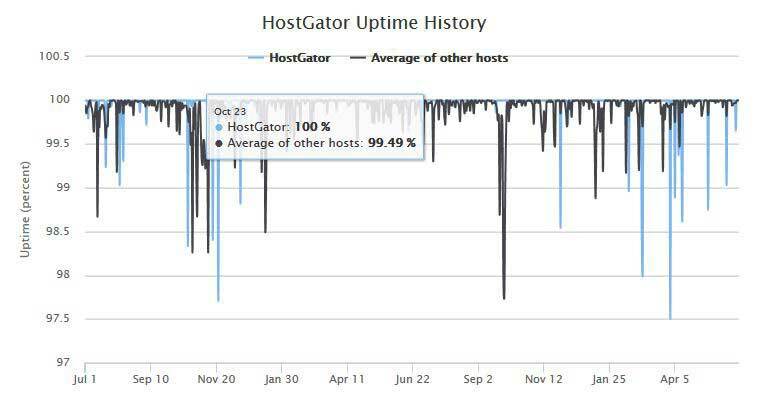 HostGator is being monitored by various host monitors and they show an excellent 99.9% uptime. According to HostBenchMarker.com, it has achieved an average of 99.96% uptime with the lowest recorded at 97.50%. HostGator customer support is available 24/7; however, the downside is that they keep you waiting for up to 20 to 30 minutes before answering the query. That put aside, their representatives are friendly and provide detailed answers to every problem. In addition, there are over 500+ video tutorials and 680+ help articles available on their online portal. HostGator does not offer automatic backup solution for dedicated servers; however, you can create your own backup solution by contacting the customer support. The host extends free protection against DDoS attacks, but for SSL certificate, the pricing starts at $39.99/month. 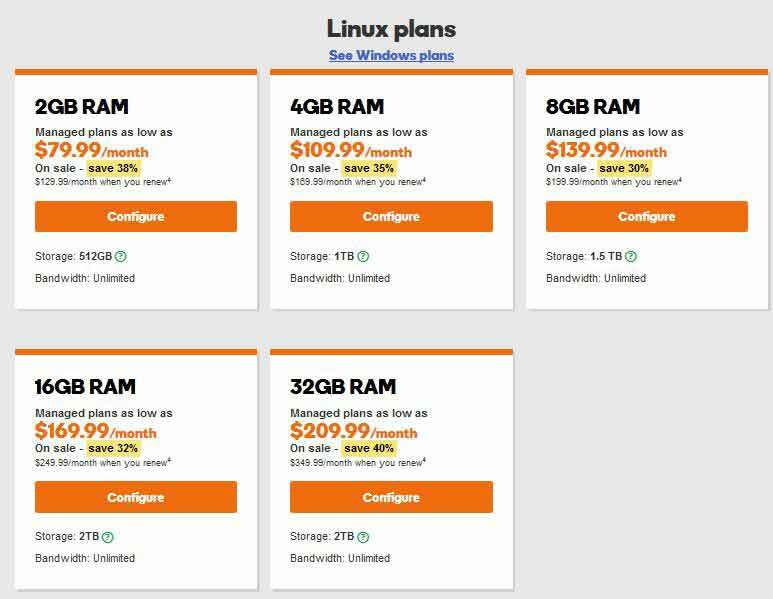 DreamHost dedicated plans start as low as $149/month bundled with impressive features such as RAID 1 storage, full root access, 1 click WordPress installer and unlimited bandwidth. The hosting provider has its own web based control panel and does not use cPanel, as this helps in saving a lot on the licensing charges. Backed up by data centers in Ashburn, Virginia, DreamHost ensures maximum level of security, performance and peace of mind. DreamHost promises a 100% uptime and if they fail to provide that, you get compensation. 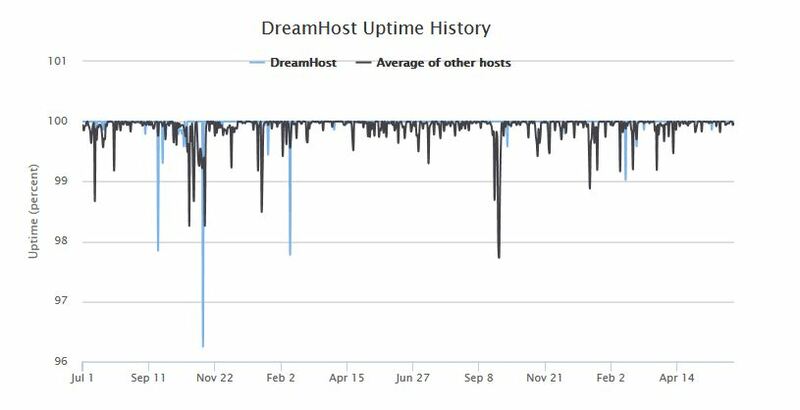 A report from hostbenchmarker.com shows that DreamHost has achieved an incredible 99.98% uptime. DreamHost has 24/7 customer support facility, but we couldn’t find the online chat option on their website. It’s only available for registered users. Others have to fill in a form and email their questions. However, there is a discussion forum where you can interact with other users and share your concerns. Since DreamHost presents both fully-managed and self-managed plans, you can either opt for automatic backup or do it manually. 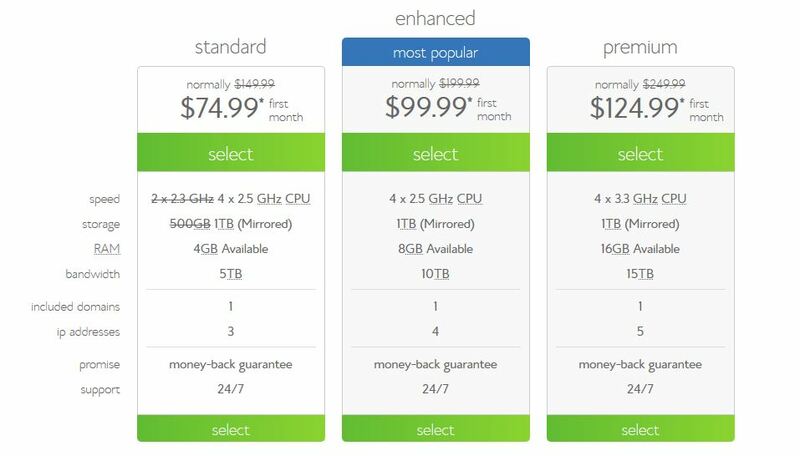 The backup cloud storage plans start at $0.95/month with 40 GB space. To apply for SSL certificate, you need an exclusive IP address. The SSL certificate costs $15/year, while for unique IP address you have to spend $3.95/month. Other security features are available on demand, which include ‘Extra web security’ and Enhanced user security’. 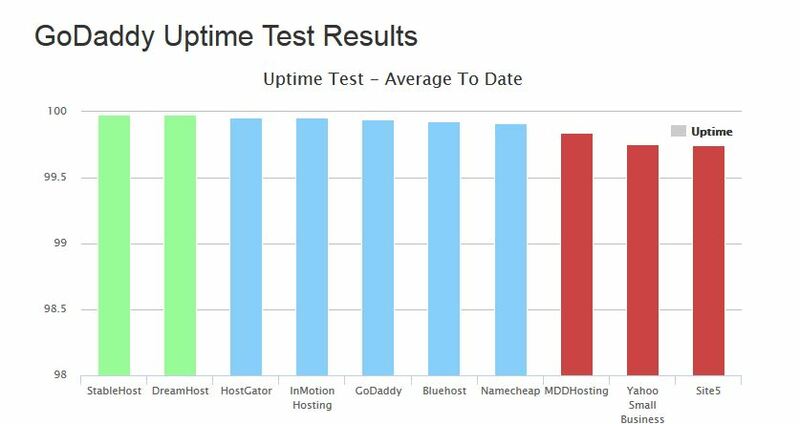 Uptime.besthostratings.com has been monitoring InMotion hosting since 2005 and reveals that the host has achieved an overall uptime of 99.90%. 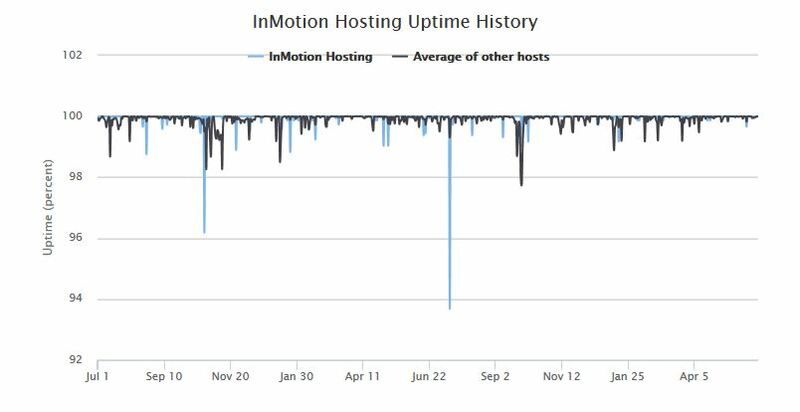 According to hostbenchmarker, InMotion hosting has an average 99.96% uptime, but it has also fallen below 94%. InMotion customer support is extremely helpful and quickly available. Whether you would like to know about the hosting plans or need some general information to set up a website, the representatives are always available to answer your queries. The 24/7 customer support is always online, whether it’s middle of a night or a holiday. Backup services are not automatic for dedicated plans. You can subscribe to the daily backup service for $7.50/month for every 10 GB of data. The SSL certificate can be purchased for $99.99 per year with an additional $25 installation fee. You can also buy the McAfee spam and virus protection; it starts at $1.39 per month.